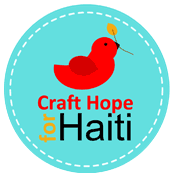 If you have not made a donation to help the people of Haiti (or even if you have) be sure to check out Craft Hope for Haiti on Etsy. All of the proceeds go to Doctors Without Borders who are working night and day to help the poor people of Haiti. My donation already sold (yeah) but there are a ton of other wonderful handmade items listed so be sure to check out more by clicking the button below. They have already raised well over $20,000!! Yeah for giving to a good cause! Oh good! I'm happy it worked out with the donating! I heard today is the last day...I'm still shopping it up. Great cause!